The global feed acids market is prognosticated to witness a healthy growth in the years to come, as reported by Transparency Market Research (TMR). The vendor landscape of the global market for feed acids is characterized by the presence of the several large as well small players. The small scale vendors in the global feed acids market are anticipated to rely on the presence of third-party distribution channels in order to penetrate into the market. Vendors are expected to engage in strategies such as product differentiation in order to gain notice in the market. Additionally, for efficient distribution of the product, vendors are expected to enter into alliances, collaborations and partnerships. Some of the prominent players in the global feed acids market are Trouw Nutritional International B.V., Biomin GmbH, Jefo Nutrition Inc., Impextraco, Corbion Purac, and Evialis. As predicted by Transparency Market Research, the global feed acids market is anticipated to rise a 6.30% CAGR between the forecast duration from 2013 to 2019. With this pace, the market is forecasted to rise from US$1,162.3 mn in 2012 to US$1,779.3 mn by the end of 2019. On the basis of its type, the segment of amino acids is anticipated to witness utmost demand against the other segments in the forthcoming years. This could be attributed to the exponential rise in the consumption of animal feed additives on account of the surge in prevalence of nutritional deficiencies in animals. 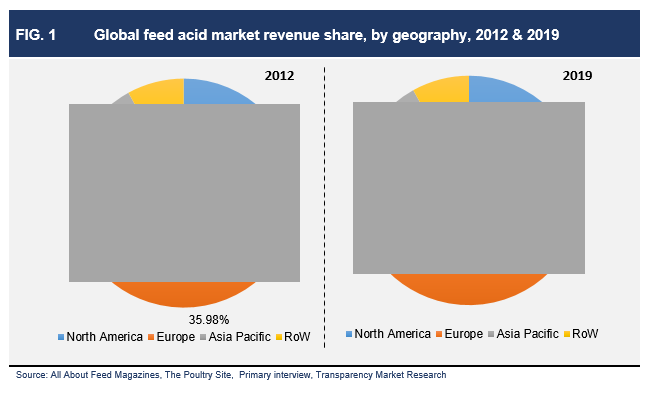 Among the geographical divisions, North America and Europe led the global feed acids market in 2012, as they held nearly 60% of the overall market share cumulatively. Across the globe, there has been a surge in the consumption of meat and products. This requires fast growth of livestock, which is instrumental in promoting the market for feed, and in turn, feed acids. With the implementation of strict regulations against the use of antibiotics, hormone growth promoters, and some other chemical substances the global feed acids market is anticipated to witness an augmented demand in the forthcoming years. Rising awareness regarding animal health in dairy and meat industry and swaying consumer inclination towards consumption of food products with lower chemical inputs, toxicity and growth hormones encourage the use of feed acids as growth promoters in feeds for livestock. The effectiveness of acidified feed for the containment of livestock endemic outbreaks further drive the demand for feed acids. The growing focus on maintaining prime quality of diary and meat products are driving the livestock industry to focus on health of the animals which is further fuelling the global market for feed acids over the period of forecast. A number of countries across the world are imposing a strict ban on the use of antibiotics in animal feed, due to which the global feed acid market is estimated to have new opportunities to grow. Manufacturers are blending different organic acids for better results. This will open new avenues for the growth of the global feed acid market. Increasing demand for diary and meat products in emerging nations is expected to provide growth opportunities for the major players in the global feed acid market during the forecast period. The rising adoption of natural and organic diary and meat products by consumers could pose a challenge for rise the global feed acids market. Antibiotics, artificial growth promoters and growth hormones are major threats to the growth of the global feed acids market, especially in countries where the regulations regarding the feed additives are less stringent.